HONG KONG, Jan. 17, 2019 /PRNewswire/ -- HONOR, a leading smartphone e-brand, has cemented its leading industry position with strong growth in 2018, despite a global industry downturn. According to IDC[i], the global smartphone market recorded a 3.1% year-over-year decline in shipments in the first three quarters of 2018 but HONOR bucked that trend and achieved a 27.1% increase. HONOR now ranks first in market share in the mid and high-end online channel market for the same period. "HONOR's unrivaled products with unbeatable value help us win support from our 100 million fans worldwide. We believe HONOR will soon meet our goal of becoming a 'Top 5' global smartphone brand within three years and 'Top 3' within five years. We have upgraded our branding this year with a new logo in moving colors accompanied by our slogan 'HONOR MY WORLD', and a new mission to create an intelligent world that belongs to the global youth. The new branding will continue to echo and further accelerate our business growth," said Mr. George Zhao, President of HONOR. The Global Launch of the HONOR View20 will take place in Paris on January 22. The flagship embodies HONOR's latest innovation and creativity. Ever since its inception, HONOR has been making history on all fronts, leading the revolution for smartphones in Artificial Intelligence (AI), performance and product design. AI is and will remain the biggest game changer for the industry. According to a study conducted by PwC[ii], AI is predicted to contribute up to $15.7 trillion to the global economy in 2030. 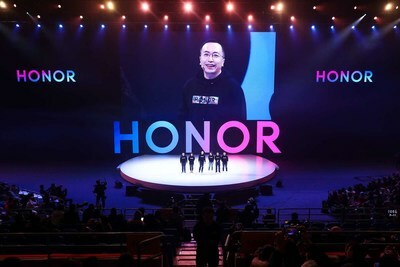 Having recognized this major trend, HONOR has recently launched the ultimate AI smartphone camera for the HONOR View20. The device leverages the AI computing power and graphic processing power enabled by the dual-ISP and dual-NPU of the Kirin 980 chipset to collate the essence of multiple photos taken by the world-first 48MP rear camera (powered by the Sony IMX586 sensor) and create a 48MP AI ultra-high-definition image. Over the years, HONOR has stunned the world with a succession of AI breakthroughs. In December 2016, HONOR launched the HONOR Magic, the first phone in the industry to feature an AI system "Magic Live" in a smartphone, to verify the ecosystem and learn how to collaborate with companies and help design apps for the cloud. A year later, HONOR took it to the next level and incorporated an AI chipset, the Kirin 970, into the HONOR View 10, enabling powerful scene recognition and self-learning capabilities. Also equipped with the same AI chipset, the HONOR 10 features a dual-lens AI 2.0 camera and an industry-first Semantic Image Segmentation technology that can recognize 500+ scenarios in 22 categories in real-time. Additionally, HONOR released a series of high-end technology last year. The GPU Turbo, launched in June 2018, is a revolutionary hardware-software integration solution that dramatically increases the graphics processing power by 60% while reducing SoC (System on Chip) energy consumption by 30%. HONOR also launched the Liquid Cooling System, which is equipped with a nine-layer thermal design and a PC-grade liquid cooling pipe. It delivers 41% increase in heat dissipation and up to 10 degrees Celsius reduction in CPU temperature for handsets. HONOR prioritizes the design of its products for both functionality and aesthetics. HONOR View20 is the perfect combination of both. The HONOR View20 comes with HONOR's brand-new screen technology, All-View Display, which features a world-first, in-screen front camera design, and a vivid and dynamic V-shape color gradient design enabled by nanolithography technology. HONOR has dominated the stylish smartphone design space ever since it introduced the element of colors to smartphones with HONOR 8's Sapphire Blue in 2016 and HONOR 9's Glacier Grey in 2017. Then, HONOR went beyond solid colors and launched the HONOR 10 and the HONOR 10 Lite in ever-changing and flowing gradient colors, as well as the HONOR 8X that features a double texture.